Good morning from New York. Day 2 of this 3 day Internet marketing educational event starts with our keynote with Richard Alfonsi (@ralfonsi), vice president of global online sales for Twitter. The SMX conference agenda says we can expect a thorough discussion of all things Twitter – from trends, to targeted ad opportunities, to tactics that can help search marketers use interests and keyword-targeting to get in front of the right people at the right time. Danny Sullivan (@dannysullivan) says that the audience can feel free to tweet the conversation. Danny plays ask the audience. How many use Twitter for their company? Everyone raises their hand. Now he’s asking about numbers of followers, 100k, 50k, 25k and there are sparse to no hands up. And to the question about who’s using the Twitter ad platform, there are maybe 20% of the hands up. Richard says that he starts to think about Twitter’s consumer experience. It’s live, real-time media, created for and on mobile devices. All tweets are visible by everyone, meaning it’s highly public and highly distributed. It’s conversational as communications go many ways, and you can have your message reach anyone else on the platform. 1. Users first. Ads are content. 2. Native ads. This has long been part of the engagement. 3. Think of Twitter as a bridge, not an island. They want to help connect other media sources as well and not dead end the convo on the platform. 1. Promoted Tweet – their bread and butter ad unit. Shows up in the user timeline. Marked as sponsored but otherwise the same as any other tweet. Auction based, how much are you willing to pay for engagement – all the Twitter verbs. There’s a quality score element as well – how much they’re willing to pay but also the quality of the ad, rewarding advertisers for being good, not being loud. 2. Promoted Accounts – a way to get more followers. In the “who to follow” module, a promoted recommendation from Twitter when a business says they want more followers. Cost per acquisition – auction based. 3. Promoted Trend – The first slot is often a promoted slot, clearly marked. A takeover, cost per day. 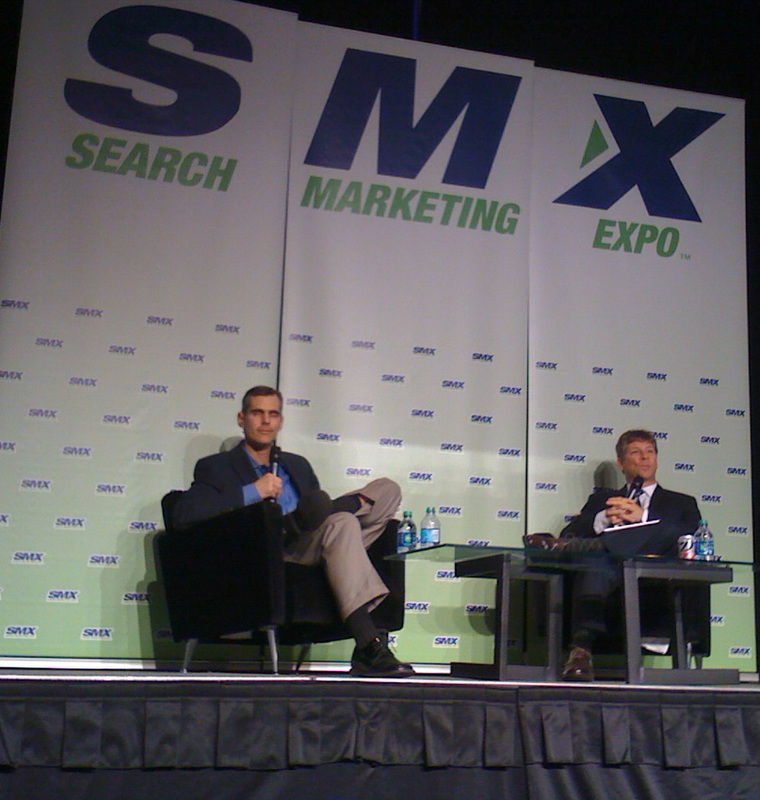 Richard Alfonsi, VP of Sales for Twitter, and Danny Sullivan on stage for the SMX East keynote conversation. The earliest adopters of the ad system have been businesses of all shapes and sizes and across all verticals, and earliest traction with big name-brand advertisers is more recent. Promoted Tweets can be targeted to the right person with the right ad in more than a dozen ways: keywords, interests, TV ads that were recently seen, location, gender, device type and operating system. They’re expanding in retargeting and tailored audiences, 2 important new targeting dimensions that are in alpha. Lead Gen Cards are also early days, launched at scale about a month and a half ago. To create email addresses and follow up with users later, and they measure results on a cost per lead basis. They have 100s of advertisers using this ad unit. 1700 leads in a week and a 5% click-through-rate is one case study success story. Another area they’re looking at developing is offline sales impact, a project in partnership with Data Logix. Being exposed to promoted tweet lifts sales 8%, if you’re a follower who engages with the tweet, the lift can be up to 29%. Measuring ROI up and down the funnel is where they’re making progress. Twitter is becoming a second screen for TV. 90% of TV experiences have conversations happening at the same time on Twitter. It’s a shared, richer, energized live TV experience. Nielsen suggests that Twitter is driving people to watch more TV since people can be part of a shared experience. It may be causing more people to tune in. When Twitter knows what someone’s watching on TV, they can also know what ads they’re watching. They’re developing a strong digital fingerprinting of users’ TV preferences and habits, and advertisers can put a complimentary tweet shortly after delivering a TV commercial, reaching the consumer on their second screen. Twitter Amplify is less about immediate and live, but it can help TV broadcasters get more mileage out of their content. A media company like the NFL can tweet out a video clip of compelling content, and that can be promoted to get broader distribution. This is an example of building the bridge. Danny asks what the opportunity is for smaller businesses. Richard says that all businesses can use the data to target their audience. While you may not be advertising on TV, you can target people who are watching, for example, Breaking Bad. 1. There’s a shift towards mobile. 2. Programatic buying. This is still anyone’s game, and they want to be big in this. They want to enable real-time bidding in their own system. 3. Improving native ads in mobile aps, providing them with a biz model that goes beyond just Twitter. Now Richard is giving cultural context and relevance of Twitter, sharing some Twitter only moments. Canadian astronaut Commander Hadfield is a popular Twitter account who tweets from space. William Shatner, George Takei, Leonard Nimoy and Buzz Aldrin all jumped into a conversation on Twitter together. These kinds of conversations are happening all the time on Twitter. Danny asks for advice for finding the conversation. How to identify trends: Know the pulse and cadence of what’s important for your business. It’s not all about the Super Bowl and the Emmy’s. It’s tweeting about BBQing on Sundays or running – Topsy will help you understand trends and keyword volume to find the cadence of these conversations. How to tap into it: Listen. Listen to what they’re talking about around these topics. As you engage, be authentic. Join the convo and be authentic to your brand and business, but don’t be intrusive. Be smart about content and targeting, and you’ll benefit from the native ad system. Keyword targeting: Think about it in terms of keywords that consumers engage with in their home timeline. This requires thinking through what the right keywords are. You can start with your list of search keywords, but people don’t have conversations in the same language as search queries. It will require you pare down your keyword lists. But keywords are a good way to enter the now moments. Danny asks how people make use of Twitter Search and how might they differ than searches on Google or Bing. People search a lot on Twitter. The fundamental mindset is intention (or did he say attention?) and real time. They want to know what the convo is around a topic. The mindset around traditional search is long-term memory. Danny asks about Twitter verification. Richard understands the importance of the blue check mark, but the main point is to verify people who may be impersonated – a celebrity or a business that needs to disambiguate. This may not be relevant for all advertisers, as not all advertisers may be prone to that type of activity. Amy Vernon asks about rate limiting during live events and if that’s something their looking into solving. Richard says that they want to protect users and that is a signal of spam, but they want to enable good content and so he’d be interested in feedback for the developers. Can the Coca Cola campaign in Portugal be recreated in a large country? People’s tweets are being aired on live TV around the idea of coming together for dinner. Richard says that the Gap put TV ads on air that they tested first on Twitter. Using the audience attention and input to sharpen a message makes a lot of sense for advertisers. Danny asks about analytics. Richard says there are a lot of analytics in the ad platform. You can also see other types of analytics off the ads platform, like follower dynamics. Danny asks how Richard uses Twitter, and Richard uses it to follow the news, but also media creators and says its interesting to get a deeper perspective of the stories they write. He’s a sports fan and follows sports media, and suggests people look at what NFL is doing. He also says technology leaders, like Rupert Murdoch and Richard Branson. He says he follows 600 or so people and never see everything everyone tweets but you get a good view of the zeitgeist. Watch the entire keynote address, courtesy of Marketing Land.